Now that we have lived through the economic and political ups and downs of the last year and even survived the end of the world, many homeowners are actively pouring in their time and resources in remodeling their homes. And guess what? Bathroom remodeling and renovation tops the list of these home improvement projects. Having busy, often stressful lives, it is becoming clear that for many of us bathrooms are becoming a lot more than just functional spaces in our homes. From using the bathroom to look sharp for work in the morning, to occupying the space to unwind after a long day during the night, we are looking for more beautiful, stylish, luxurious bathroom spaces. Innovations in bathroom design, decor, vanities and accessories keep on multiplying, so there is no shortage of creative ideas and cutting edge products to help bring you closer to realizing your dream bathroom project. If you thought tiles were boring and had an office-like feel, think again! Today, tiles are one of the best ways to give your bathroom a total make-over and achieve a unique look. You are no longer confounded to traditional ceramic tiles of standard sizes and colors. Instead, you can let your imagination run wild with a wide range of possibilities for tile materials such as porcelain, glass, metal, stone in addition to the good ol’ ceramic. Each material offers a distinct look and comes in wide range of colors, sizes. 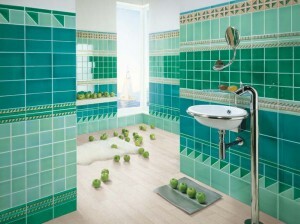 Of course, for truly upscale and luxurious bathrooms you can go all out and custom order your own tile patterns. You can do as much or as little with tiles as you like, from having accent tiles around your vanities, to floor or wall tiles, to covering your entire bathroom with tiles from floor to ceiling. 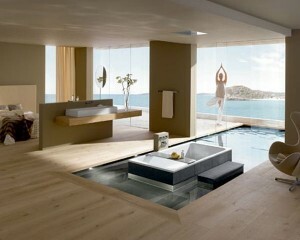 One trend that is hard to ignore is the collective desire for a truly luxurious bathroom space. The feeling of a personal spa, a safe haven within your own home. One way to achieve this look and feel is to get rid of the traditional big bulky tub and install a beautiful soaking tub that you can sit and relax in for hours by yourself or with someone special. Another highly option is to go for an expanded, walk-in shower space with frame-less glass, benches, niches and dual shower heads. When it comes to vanity tops, granite is no longer the only luxury option. More and more homeowners are discovering the unique beauty of such upscale materials as travestine, quartz, and Calacatta marble. Increasingly, homeowners are seeking comfort in their bathroom spaces. Nothing is more cozy and comfortable then stepping onto a warm floor after the shower, rather than being shocked by freezing cold floor tiles. Consequently, more and more homeowners are opting to heat their bathroom floors and there is a wide range of possibilities to choose from. 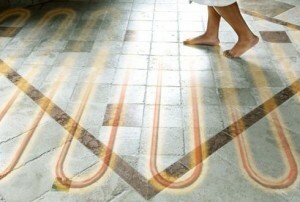 Consider such options as radiant electric heating, a special mesh that is placed under tiles when they are set and is connected to a thermostat on the wall, electronic heat-mat systems that can be placed both under the floor and under the walls. Many of these options use little energy and will not cost you thousands of dollars to purchase and install.